Apple's latest - and disappointing - annual iPhone product unveiling also revealed the two biggest headaches troubling CEO Tim Cook today: first is the lack of a new "must have" gadget (Apple watch EKG aside), with the iPhone failing to impress the faithful for the second year in a row, and prompting sellside analysts to conclude that for one more year there won't be a "must have" iPhone supercycle. 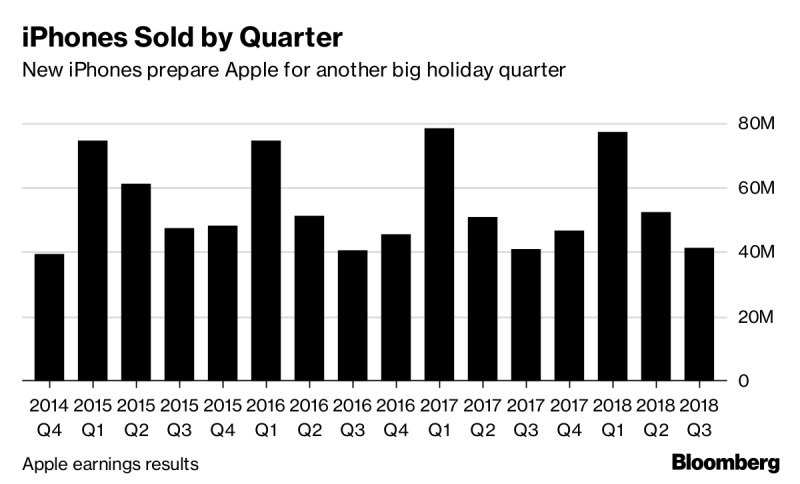 Second is that as a result of this lack of creativity and innovation, and perhaps due to market saturation, iPhone sales have now been largely stagnant for three years, with AAPL reporting a modest decline in iPhone sales in the last quarter. Which leads us to the most closely watched part of yesterday's Apple presentation: the price points of the various iPhones, which will be key in establishing both projected and realized average selling prices. And since total revenue is a function of total sales x prices, Apple is now focusing exclusively on the price point, realizing that volumes may have topped out. 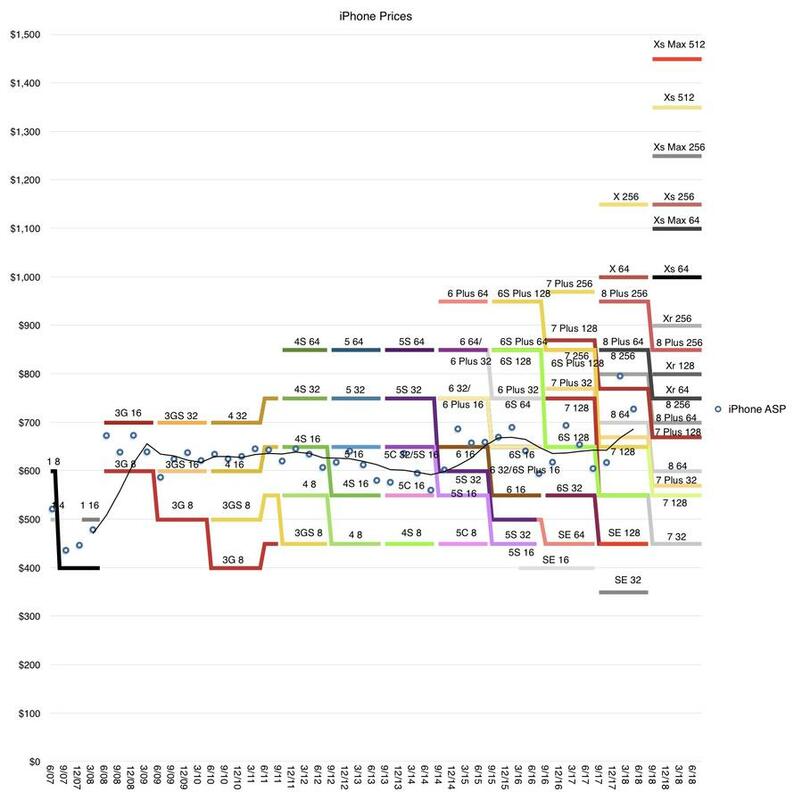 For the best visual representation of just how inflationary Apple's "price hiking" strategy is, we present readers with the following chart from Horace Dediu, which shows that after pricing the original iPhone 1 around $500 a decade ago, the top end iPhone XS Max 512 will now cost $1,449 - or as much as a top of the line notebook computer - with many of the "well-equipped" new models selling for over $1,000, while a variety of legacy models will still be available for as low as $500. In other words, a price point for everyone, or so Apple believes with Tim Cook naturally hoping that the bulk of the new iPhones sold will in the highest pricing tier cluster. Will this strategy, coupled with the magnetic attraction of Apple's ecosystem work, or will Apple's lack of innovation and chronic recent plagiarism of the best Samsung features eventually end up costing Cook remains to be seen. The first channel checks of the new iPhone will be available in late October when the new generation of iPhones goes on sale. Check back then. One thing is clear: for all those who claim that new technology is supposed to be deflationary, Tim Cook's strategy is anything but.